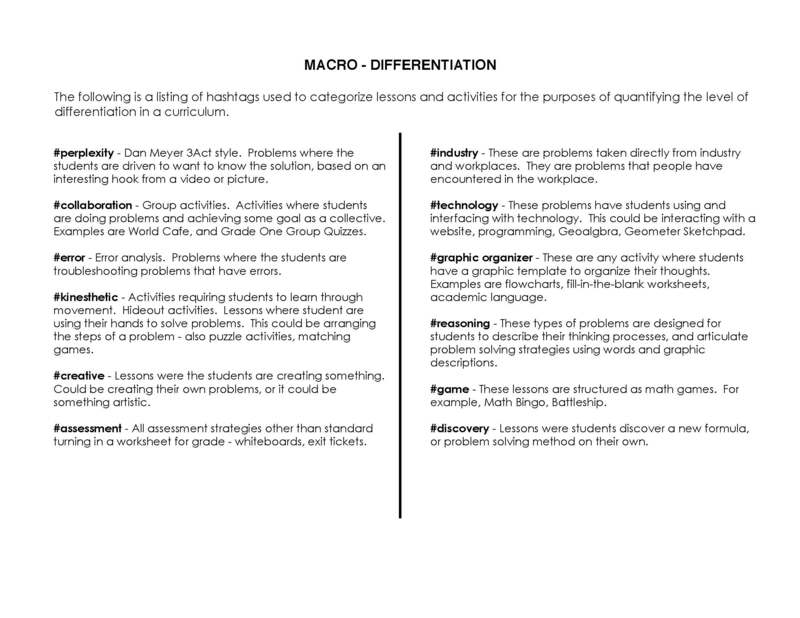 My name is Brian Miller (@TheMillerMath) (brianmiller707 at gmail) and this blog is meant to share my vision of a differentiated math curriculum. I am sharing the specific lesson plans I use under 12 different catagories of differentiation – #assessment, #collaboration, #creative, #discovery, #error, #game, #graphic organizer, #industry, #kinesthetic, #perplexity, #reasoning, #technology. Notice how I can quickly look back on what I have been doing and know that I have been doing multiple #collaborative and #game, as well as #perplexity, #technology, and #graphicalorganizer lessons. So in just a couple seconds I can see that I need to make sure that I do an #error, or #kinesthetic lesson in the next week or two.